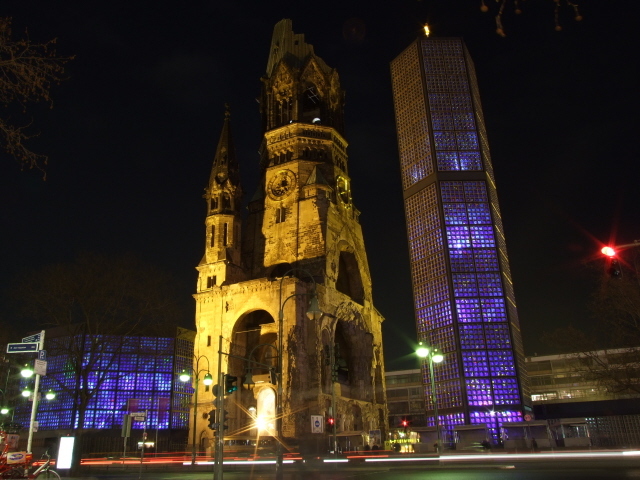 The landmark WWII church ruin in West Berlin, the main tower left in its semi-collapsed state to serve as a memorial. It's complemented by a modern church next to it and the ground floor hall of the ruined tower now houses a small exhibition. More background info: The old church, of which today you can only see the broken tower of, wasn't actually that old, only constructed towards the end of the 19th century, and was consecrated in 1895. 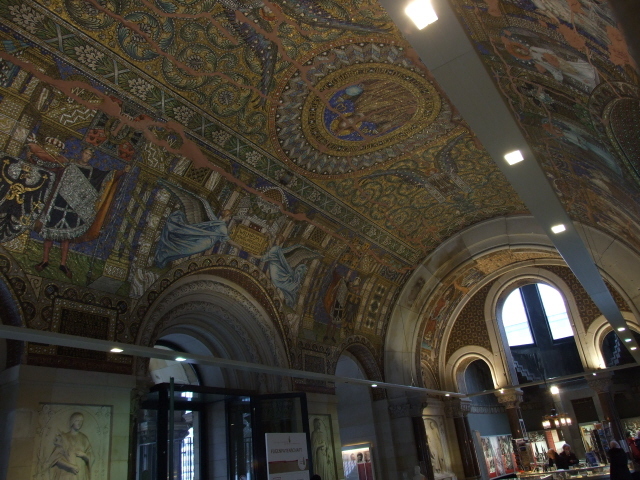 The project was instigated by the ill-fated last Prussian emperor, Wilhelm II, in honour of his rather grander grandfather emperor Wilhelm I, and accordingly named Kaiser-Wilhelm-Gedächtnis-Kirche in German (so now you know which William it is in memory of …). The design of the church was somewhat unusual for the region, partly because the architect modelled it on his homeland style of the Rhineland, employing sandstone and an overall neo-Romanesque approach coupled with neo-Gothic elements. The main tower (of five in total) stood 370 feet (113 m) tall and the church had seating for over 2000 people. During WWII the church was badly damaged in an RAF air raid on 23 November 1943. The nave was almost completely destroyed and burned out, but parts of the outer structure and, in particular, the main tower was left standing, although the top of the spire had collapsed. 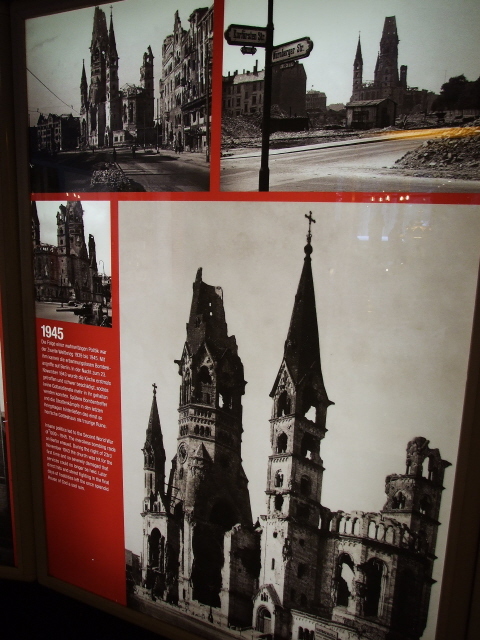 After the war, the shell of the ruined church quickly became something of a memorial landmark of West Berlin. In 1956/57, architect Egon Eiermann won a competition for the design of a new church at the site. To make room for it, most of the area space of the old ruin was cleared, i.e. the remaining walls demolished. Originally, the main tower too was supposed to go. But widespread protests forced the architect to instead incorporate the old tower into the ensemble. The result is today's stark contrast of (pseudo-)old and ultra-modern architectural styles sitting immediately adjacent to each other. The characteristic blue glass window walls of the church were designed by the artist Gabriel Loire from Chartres in France (a city itself famous for its ur-Gothic cathedral with its outstanding stained glass windows). What there is to see: The ruined church tower that forms the heart of today's ensemble, is also known as "Hohler Zahn", or 'hollow tooth', in that typical sarcastic way that characterizes Berliner speech. And the resemblance cannot be denied. The top of the main spire is broken off making it look like a broken tooth at the top at least. The rest of the edifice is less damaged, but completely hollow too, except at the base (see below). The rest of the destroyed church was taken down and the rubble cleared away after the war. In its stead a modern church tower was built, now standing side by side with the old one. The architectural contrast could hardly be starker – but somehow it works. The hexagonal new bell tower is inaccessible to the general public – unlike the octagonal modern main church building which flanks the old ruined tower on its other side (see below) and is constructed in the same style of walls made of a concrete honeycomb frame filled with glass blocks mostly of blue colour tones. After dark when the church and new tower are lit up inside they give off a cool bluish-purplish glow. Also part of the whole ensemble are a low, rectangular chapel as well as a foyer, also in a simple rectangular form, attached to the main modern church building. 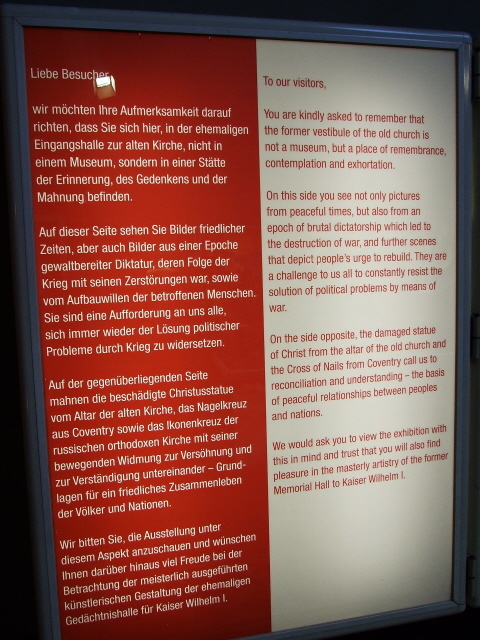 The memorial hall at the base of the old church's main tower contains a small exhibition which is likely to be the main point of interest from a dark tourism perspective. Here the history of the church building, in particular its destruction in WWII as well as its post-war redevelopment are chronicled. This is done mainly through a number of photo-and-text panels – which are bilingual, in German and English. 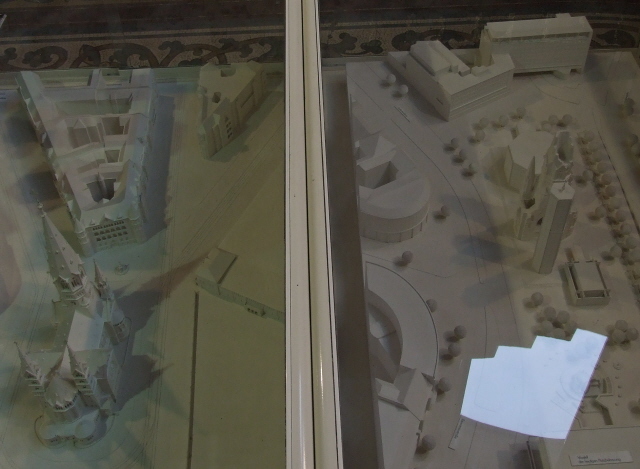 There is also a dual model of the church and surrounding area before its destruction and, for comparison, how it looks today. 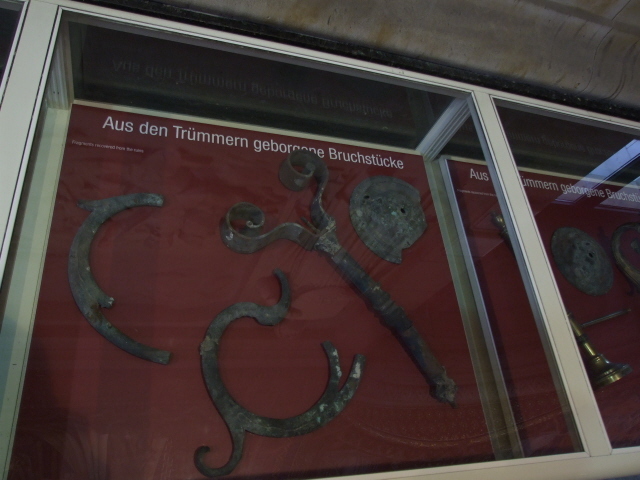 In addition artefacts exhibited include items salvaged from the rubble of the collapsed nave. 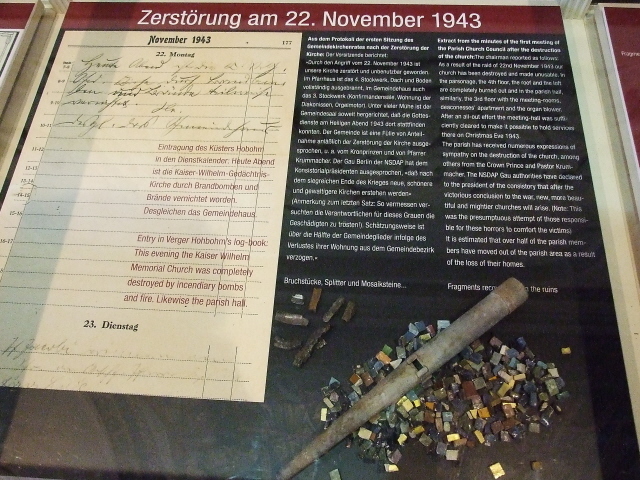 At one end of the memorial hall stands a gift from Coventry Cathedral in England (which was destroyed by German aerial bombardment): a copy if its iconic Cross of Nails. While you're there you could also pop into the active modern church next door. The interior is quite stunning to behold for the light effect generated by the blue glass window walls during daylight hours. When I visited, the atmosphere was eerily underscored by the organ being played (probably just a practice session) – a very avant-garde piece full of clusters and unconventional ethereal melodic lines, lending it a certain SciFi/horror-film-like sound. Location: In the very heart of the west of Berlin, in the district of Charlottenburg, more precisely on Breitscheidplatz, the large pedestrianized square between the eastern end of the Kurfürstendamm boulevard to the south and Budapester Straße/Kantstraße to the north. Access and costs: easy; free. Details: the central location at the heart of West Berlin makes it easy to get to, right by the metro station Kurfürstendamm (U1 and U9). The hub of Bahnhof Zoo is also just around the corner (served by all central regional metro S-Lines; outside is the terminus of many of Berlin's most tourist-friendly bus lines too, including the Nos. 100 and 200 that provide convenient connections to the tourist hotspots of Potsdamer Platz, Brandenburger Tor/Unter den Linden and Alexanderplatz). Opening times of the memorial hall: Monday to Saturday 10 a.m. to 6 p.m.; Sunday 12 noon to 5:30 p.m. (closed Good Friday); the modern church is a working protestant church so visiting should be possible at all normal times, but should be avoided when services are on (unless you want to partake, of course). Admission free; but donations are welcome. Time required: Not long; the memorial hall's exhibition may take up half an hour or so, otherwise it's up to you as to how long you want to look at the church ruin itself and whether you want to spend any time in the modern church. Combinations with other dark destinations: in general see under Berlin – the closest dark attraction would be the Story of Berlin Experience, halfway down Kurfürstendamm south-west of Breitscheidplatz. 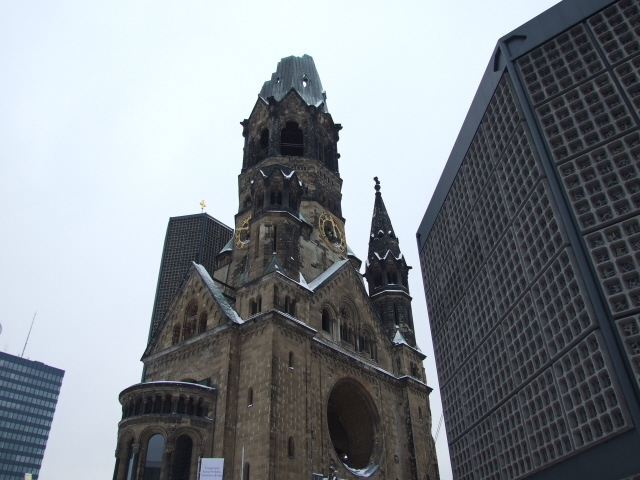 Combinations with non-dark destinations: The church sits right at the centre of what used to be West Berlin, at the top, eastern end of the famous Kurfürstendamm boulevard, which was arguably West Berlin's premier shopping street and entertainment hub. Although these days it has been surpassed by the redeveloped formerly East Berlin centre of Mitte and in particular by that district's central boulevard Unter den Linden. Close to the church, just to the north, is another of Berlin's prime attractions, the famous Zoological Garden and its aquarium – both world class. Those who are into luxury shopping experiences (be it actual shopping or merely window shopping) get the best such treat in the whole of Germany in the celebrated Kaufhaus des Westens department store, on Tauentzienstraße just a couple of hundred yards south-east from Breitscheidplatz.